Changes to the MOT test will introduce stricter rules for diesel car emissions and a three-tier defect system. Stricter emission limits for diesel cars with a diesel particulate filter (DPF) will be introduced as part of the revised test. A DPF captures and stores exhaust soot to reduce emissions from diesel cars and vehicles will receive a major fault and instant fail if the MOT tester can see smoke of any colour coming from the exhaust or finds evidence that the DPF has been tampered with. Defects discovered during the test will be categorised as either dangerous, major or minor and will depend on the type of problem and how serious it is. Dangerous and major defects will result in an instant fail and require immediate repair before being allowed back on the road. Vehicles with minor defects may still be passed but testers will advise that the fault is addressed as soon as possible. MOT testers will still give advice about issues motorists need to monitor, also known as advisories. Seven new items have been introduced to the MOT test. The actual paper MOT certificate has been redesigned to make it clearer and easier to understand. 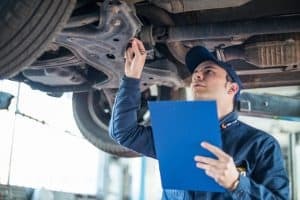 It will now list any defects under the new categories, while the service to check the MOT history of a vehicle will be updated to reflect the changes. Previously, only vehicles first built before 1960 didn’t require an MOT, but the new changes extends this to vehicles that were registered more than 40 years ago.